Jadea Kelly is a singer-songwriter I admire. 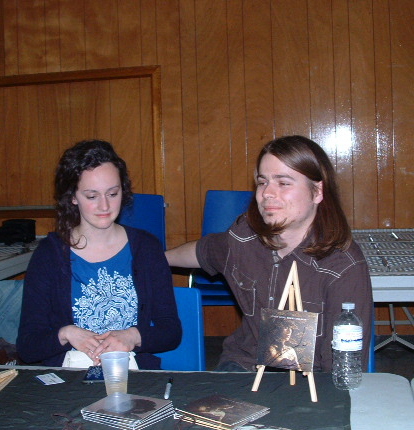 Here she is with Justin Ruppel, a drummer who played in the band when I first heard Jadea sing a couple of years ago. It isn’t often we are treated to a singer that has the ability to transport us, but Jadea has it. Three years ago, she released her first CD titled ‘Eastbound Platform’ which I play often now, especially when driving on a quiet highway. She’s released her second album ‘Clover’ and you are now able to listen to the entire playlist. I can’t find the right words to describe how excellent her voice is, nor how expert the band has complimented each track. I hope many of you will listen to this. It really is worth it. This entry was posted in Artists of Note, Music, Photography and tagged art, Finepix 3800, Jadea Kelly, photo, playlist, singer, songwriter. Bookmark the permalink.